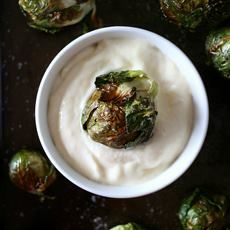  and  Roast the whole stalk of Brussels sprouts and serve with a lemon-garlic dip (photos courtesy Nutmeg Nanny). Last year’s fun cruciferous preparation was the Cauliflower Steak, along with its big brother, Whole Roasted Cauliflower. 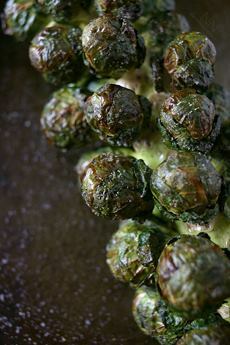 Meet this year’s classy crucifers: Brussel Sprouts “Bone In”, the brainchild of the ever-innovative Chef Eric LeVine who provides the clever name (the conventional name is “on the stalk”). You can also make classic aïoli (garlic mayonnaise) or buy it. You can also use a different flavored mayo: curry, lemon sriracha, etc. 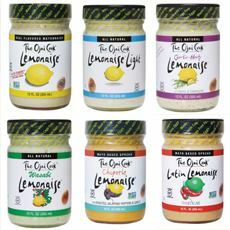 Our favorite brand of flavored mayonnaise is Ojai Cook, a two-time NIBBLE Top Pick Of The Week. It’s also one of our favorite house gifts and stocking stuffers. CAN YOU EAT BRUSSELS SPROUTS STALKS? Yes, with a lot of elbow grease. 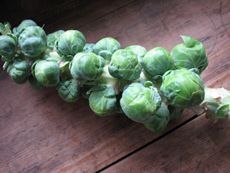 Unlike broccoli and cauliflower stalks, brussels stalks are very tough and fibrous. You need a cleaver to cut through them. You can, however, easily eat the stems that attach the sprouts to the stalk. Remove the sprouts and chop the stalks into 3- to 4 -inch pieces with a cleaver. Hacking away with a cleaver is enjoyable for stress management. Steam the pieces for at least 25 minutes or longer. Then, try different freestyle approaches to eating them. Try gnawing at the skin. But then, use a paring knife, peel off the tough, woody layer, which truly is inedible by humans. The core inside is not big, but is rich and creamy and worth trying. Or, simply enjoy the engaging presentation of cooled sprouts on the stalk, before turning it into mulch. Brussels sprouts on the stalk will taste fresher and sweeter. The challenge is that the sizes differ. When you buy them trimmed and packaged, they’ve been sorted by size. The same roasted Brussels sprouts can be eaten plain, as a main course side, or halved and tossed into a green salad, or used in other preparations. We adapted Chef Eric’s recipe with one from Nutmeg Nanny. *If you don’t want to roast the garlic, you can use raw garlic: 2 minced cloves per cup of mayonnaise. 1. PREHEAT the oven to 350°F. Rinse the stalk and the sprouts. 2. MIX the oil, salt and pepper and brush or sprinkle the seasoned oil over the sprouts. Place on a baking sheet or in a shallow pan and roast for 45 minutes until slightly soft and browned on the outside. Rotate the stalk one-third of the way every 15 minutes to ensure equal cooking. Check the small sprouts with a cake tester or toothpick. When the small ones seem soft (but not mush), the larger ones will be al dente. Explain this when serving, since people have different preferences. Buy brussels sprouts on the stalk—they taste fresher. 3. MAKE the dip while the sprouts cook. Blend all ingredients and refrigerate until ready to serve. 4. REMOVE from the oven and placer on a serving platter. Serve with a dip and scissors to cut sprouts from the stalk. You can just pull them right off the stalk, but some people may want a utensil.